As Fall starts to show, the Advisory is beginning to move onto new and exciting paths. We have a few different updates to share with you. But first off, we want to extend further thanks to those who responded to the proposed recommendations from the Advisory to the NAC with respect to the hiring process. Your feedback is highly valued and we are grateful for your thoughtfulness. The recommendations were submitted to the NAC on September 30, 2106. Since then, the advisory committee along with Brittany Ryan and Sarah Garton Stanley have been working with Human Resources on the job announcement and for the first Artistic Director of Indigenous Theatre. While the technical aspects of the hiring process has now shifted to human resources, there is still much for the Advisory Committee to do. The Committee comprised of Reneltta Arluk, Dave Jenniss, Annie Smith St. Georges, Jesse Wabegijig, and Kenneth T. Williams will be coming together for another day long meeting on October 24th to discuss next steps. Now what? Some of the goals of this meeting are to discuss what it looks like to shift into a committee of support for the Community and for the NAC, generating ideas and suggestions for the specifics of the hiring process -- namely, what the “Community Engagement” process looks like, the process for engaging with the Elders Council, and helping provide names for for the different committees that will need to be formed as the applications for the Artistic Director, Indigenous Theatre move forward. October 24th is timely because the committee’s role will be shifting as soon as the job description is released to the public and community at large. The announcement is expected to go public at the end of October. Exciting times! On October 18th, Sarah and Brittany had the tremendous pleasure of witnessing Gord Downie’s Secret Path in concert at the NAC. Gord’s questioning of what it means to be “Canadian”, the words of Justice Murray Sinclair and, of course, the story of Chanie Wenjack moved him to write an album exposing Canada’s truths. 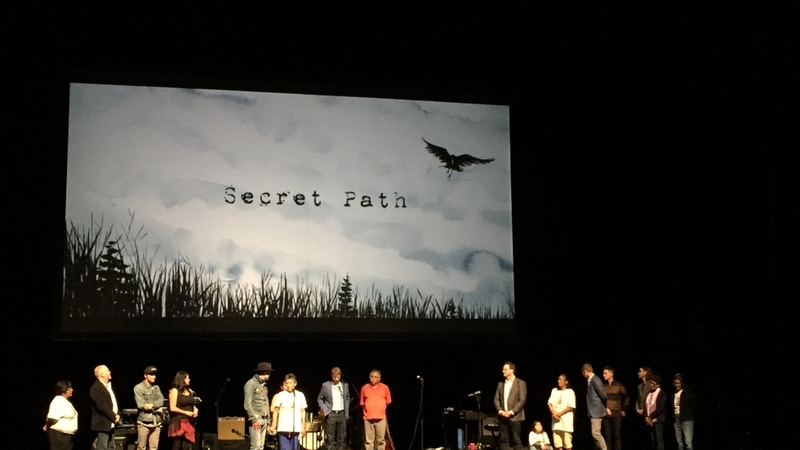 Secret Path is completely dedicated to Chanie Wenjack who died while fleeing the Cecilia Jeffrey Indian Residential School near Kenora, ON. You can read Gord Downie’s full statement here and see the NAC event description here. Kevin Lamoureux is the Associate Vice President – Indigenous affairs at the University of Winnipeg. He comes into this role having served as an award winning course Instructor for the U of W, the University of Manitoba, and several other post-secondary institutions. He is a well-known public speaker, a writer, and co-host of the popular podcast The Frank and Kevin Show: In Colour (a free, sometimes funny resource on topics of Indigenous education and politics). Lamoureux served as co-Chair for the Provincial Task Force on Educational Outcomes for Children in Care in 2015 and his writing and reports have been featured in the Winnipeg Free Press, Grassroots News and many academic journals. He has been seen on local television (including APTN and the CBC news), heard around the world through his podcast (which is downloaded in over a dozen different countries), and he has given presentations around the globe (from Australia, to Thailand, parts of Europe, the United States and throughout Canada). Lamoureux was named Scholar in Residence and Divisional Day Speaker for the Seven Oaks School Division, Diversity Coach for Sunrise School Division, Divisional Day Speaker for St. James School Division, and works closely with education authorities across the country. He has consulted for government, justice, philanthropy, and throughout the private sector. Kevin Lamoureux is working towards his PhD in the University of Manitoba's Wellness and Sustainability cohort. He works closely with schools throughout Manitoba in support of Aboriginal education and the inclusion of Aboriginal perspectives; enrichment and talent development, as well as working with troubled and disengaged students. He is the recent recipient of the Aboriginal Circle of Educators Honouring Our Ways award, the Robin H. Farquhar Award for Excellence in Contributing to Self-Governance as nominated by his colleagues, the University of Winnipeg's Merit Award, the International Center for Innovation in Education (ICIE) Young Scholar Award, and the University of New England’s Merit award for outstanding academic performance. As the Associate Vice President of the University of Winnipeg, Lamoureux is working in partnership with many to nurture safe space for Indigenous learners and knowledge. Thank you for taking the time to read these updates. Please feel free to send them to Brittany at brittany.ryan@nac-cna.ca. We look forward to sharing more updates with you!